This one always humors me. 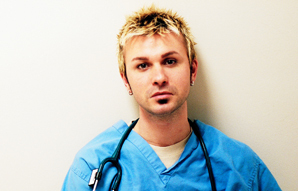 Do I get angry because someone called me a ‘male nurse’? Some of the other versions of this story are when patients ask me, “How long have you been a male nurse?”, or “How bad is it being a male nurse?”. It honestly has everything to do with the tone of their voice when asking the question that usually dictates my response. In most cases I find a comical way to put them in my shoes. I answer with, “How long have you been a male/female patient?”, or “How bad is it being a male/female patient?”. If the question comes from a health care professional I’ll re-word my rebuttal so that it involves their given area of work or profession. I can honestly say I can’t remember the last time a fellow health care professional asked me a question related to my gender? I think it’s a personal perception and preference. Why in the world would a fellow male nurse get angry at these questions? I mean we are nurses…and uhh..we are of the male persuasion. So why get mad? In most cases I don’t even think the person asking the questions considers them offensive. They are just curious about you being the obvious minority in a very female dominant profession — not to mention the stereotypes that are out there.